Note: Donations are no longer being accepted for Mother's Day as the cards to honorees have been mailed. Donations for Father's Day will continue to be accepted through the end of May. Thank you to all who've donated and made this such a success! 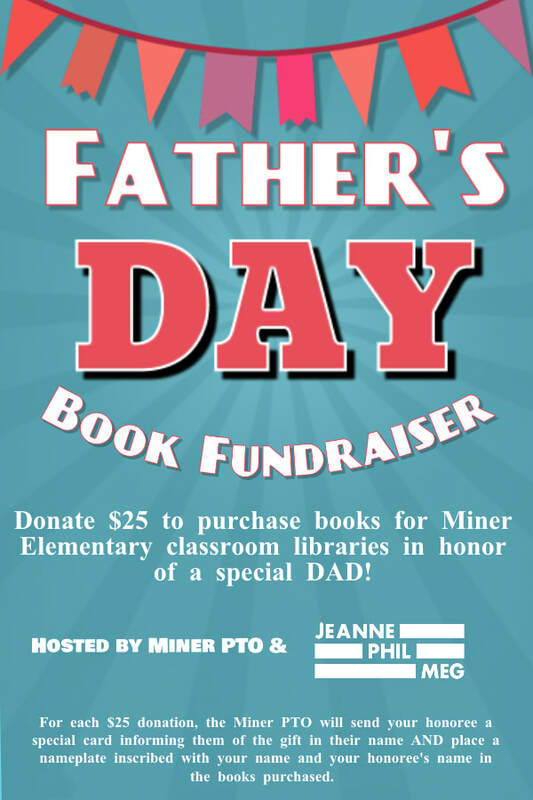 We've raised over $2,000 to purchase books for Miner's classroom libraries! 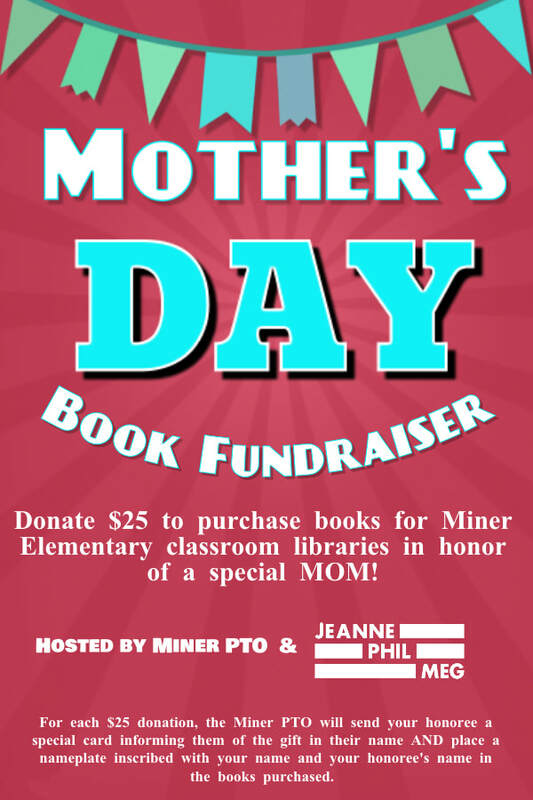 The Miner PTO is joined by the Phil & Jeanne & Meg Team from Compass Real Estate in hosting a Mother’s Day and Father’s Day book fundraiser to purchase books for Miner Elementary classroom libraries in the name of a loved one. All funds raised will be used for this purpose. For each $25 donation, the Miner PTO will send your honoree a special card informing them of the gift in their name AND place a nameplate inscribed with your name and your honoree's name in the books purchased. Our goal is to help improve Miner students' access to quality literature in their classrooms - a win for everyone! Use the following link to provide information about you and your honoree(s): goo.gl/forms/tAsLcR2zDWyDw5v83. A subsequent link will take you to our payment page (squareup.com/store/miner-elementary-parent-teacher-organization). 1. Why are you fundraising for classroom libraries? 1A. Principal Jackson identified the need for improved classroom libraries last fall. While we have an great school-wide library, the individual classroom libraries are in desperate need of a collection upgrade. 2. Can I donate less than $25? 2A. Of course! Any donation will help our effort. Only donations of $25 will receive the card + book nameplate. 3. Can I select the book to purchase? 3A. Unfortunately not. We will not purchase the books until the fundraiser is completed and we know how much money as been raised. Teachers have put together wish lists of books they'd like to have for their rooms. Based upon the success of the fundraiser, the school will help us figure out how to fulfill as much of those wish lists as possible. 4. Can I donate more than $25 to honor more than 1 person? 4A. Absolutely! The google form allows you to designate up to two honorees ($50). If you want to donate/honor more, just keep filing out new google form links! 5. Will my grandmother (my special honoree) receive her card before Mother's Day? 6. Can I donate in memory of my dad? 6A. Most definitely. We will customize the nameplate placed in the book that your donation is in memory of your dad - just make note of that while completing the google form.